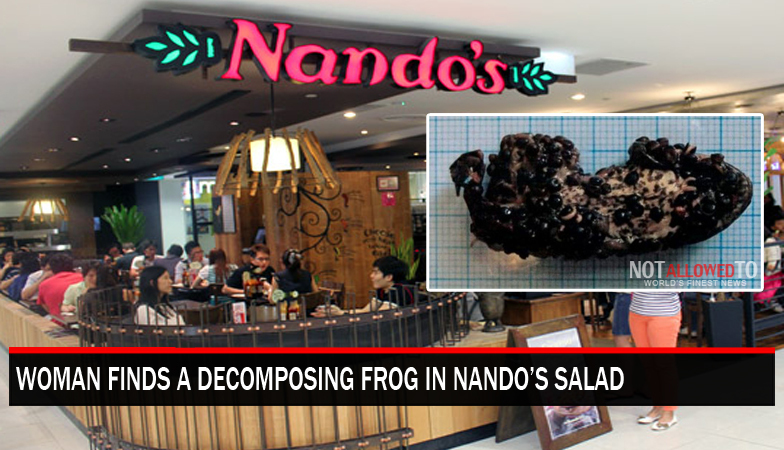 A woman was physically sick after she discovered a decomposing frog in her salad at Nando’s. Louise Rudd, from Stockport, U.K reported the incident after she ate at Nando’s. She had already finished most of her meal when the grim discovery was made. Woman said she had “eaten most of” her meal before she encountered the amphibian(frog) at the bottom of her bowl. We make every effort to ensure that our food is served to the highest standard. We continue to work with all of our suppliers to ensure that they deliver to the quality and standards we expect. Ms Rudd, said she was physically sick after discovering the dead frog. She said the Nando’s area manager had compensated her with vouchers for a restaurant of her choice. There is nothing cheeky about that meal, and I’d be asking for supermarket vouchers and cooking my own food after an experience like that.